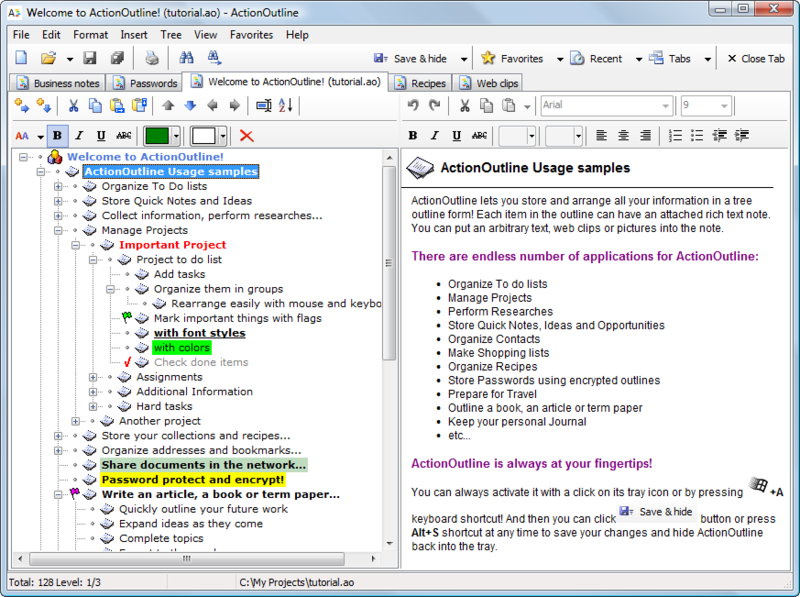 A simple yet useful organizer, ActionOutline consists of an Explorer-like interface where you can store and arrange all your information in a tree outline form. You can arrange items using keyboard or mouse, cut and paste branches, place checks or tags, search, print, export, link to web or local files. You can protect your documents with encryption and password. Your outlines can be shared on the network and you can collaborate with other users. ...... Arrange items using your keyboard or mouse, cut and paste branches, highlight items with different font styles and colors, place checks or tags next to listed items, search information, print data, export to the external file, or link to web or local files. With tabbed multi-document interface, ActionOutline lets you handle multiple outlines with ease. You can share your outlines on the network and collaborate with other users. Your outlines can be protected with strong encryption and password. You can download and try ActionOutline totally free for 30 days. Download it right now! Qweas is providing links to ActionOutline 3.2 as a courtesy, and makes no representations regarding ActionOutline or any other applications or any information related thereto. Any questions, complaints or claims regarding this application ActionOutline 3.2 must be directed to the appropriate software vendor. You may click the publisher link of ActionOutline on the top of this page to get more details about the vendor.